Just for giggles I thought you might like to see my work space. 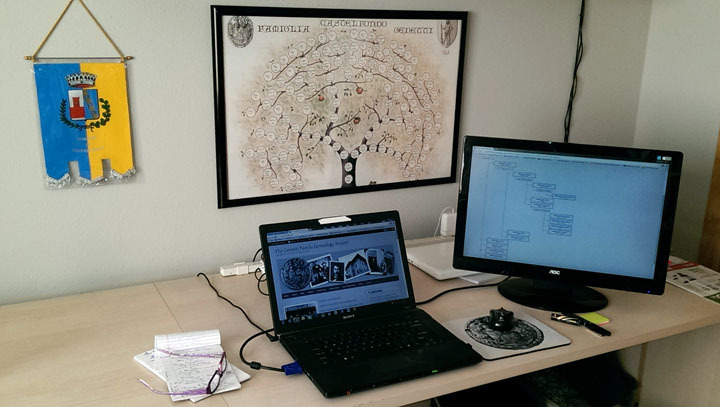 This is where I do family research, work on the Genetti Family Genealogy website and blog, and ponder over ancestry mysteries. Hanging on the wall is a print of our family tree, where I can easily reference it. The bright blue and yellow banner on the left was given to me by Dino Marchetti, an ex-mayor and unofficial town historian of Castelfondo. It contains the Coat-of-Arms of the Commune of Castelfondo, Italy. 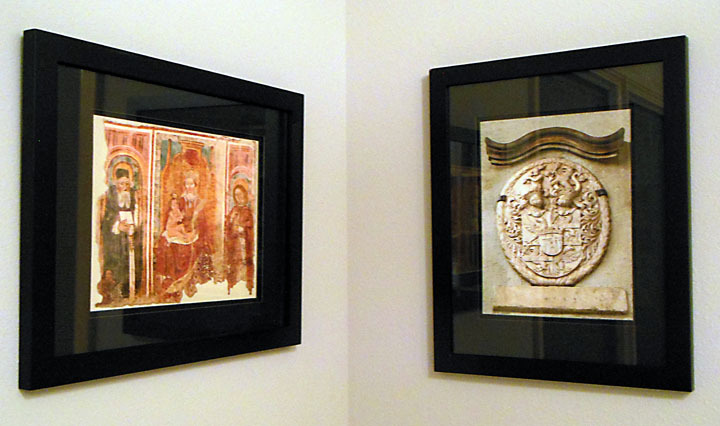 On the wall to my left hangs a print of the carved marble family coat-of-arms (called a “stemma” in Italian), and a print of the Gothic fresco that graces the front wall of the Genetti homestead in Castelfondo. This all sets the “mood” when I sit down at my computer to dig through names, dates, old newspaper articles, data bases and photos. I also have a bookshelf filled with books about Italy, the Tyrolean culture, documents and photos sent to me over the years, and a huge binder containing research notes. Lol …yes, I guess you could say that I am passionate about genealogy! ← Getting Ready for Christmas!